Actually, I'm not sure if we've already moved from 'grown-up' to old people, but we'll just go with it. Last weekend was my kids' annual camping trip with my parents. They look forward to it all year and always have a blast. Hubby and I seldom get babysitters the rest of the year and make plans to live it up while we're temporarily childless and without a curfew. This year, he wanted to get REALLY crazy and run away to a bed and breakfast, but after a few days of getting the kids ready and packed, I didn't have the heart to do it all again for us - I wanted to stay home and enjoy a bit of peace and quiet - a different atmosphere than the happy hustle and bustle when the kids are with me. My other requirement was that I wasn't cooking. So really, the weekend was mostly about eating out. All. The. Time. 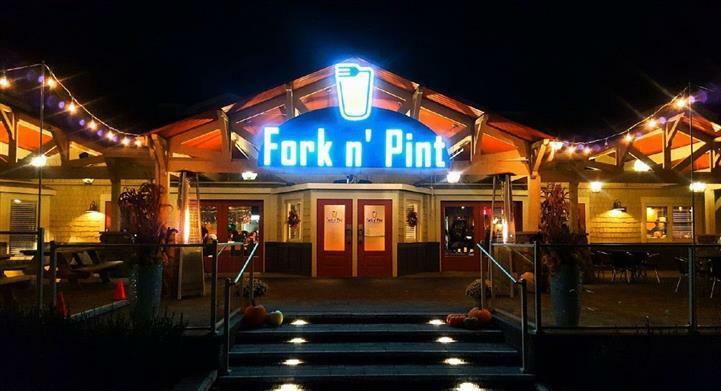 Friday night we made it to Fork n Pint in Waterford, MI a few minutes before 6pm - $5 pretzel bread!! 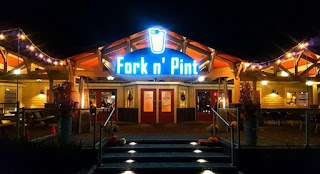 I was excited to go here because there's another location opening in our town in the next month or so. Since our town is full of mostly BBQ and Mexican places, they'll probably be really busy with those wanting some variety once they get here. We did indeed arrive in time for happy hour and took advantage of the Pretzel Bread with a cheese fondue and a dijonnaise dipping sauce for $5 (regularly $8). They were delicious, and hubby and I could not agree on a favorite sauce - both were great! I then went with the Marinated Sirloin, while hubby had the Chicken and Waffles. We were both again very happy with our choices. I held back to purposely have a few slices of sirloin and potatoes left for lunch one day this week (but accidentally ate them for breakfast Tuesday..). With a little more butter added to the potatoes, it was delicious reheated as well. I also enjoyed an adorable mini dessert to wrap it up. It was a raspberry and lemon cake on the evening we were there, and it was a perfect sweet bite to end my meal. While I certainly could have eaten more, I felt responsible for just having had a mini ;). Saturday morning I called for some mom time and slept in while hubby went to a 'cars and coffee' meet up with some friends at a local track. By the time he got back, I was rested, refreshed, and ready for more fun .We headed first to Lake Orion to walk around a car show that was just a few streets of pretty much classic cars. It only bothers me a little that some of the 'classic' cars are not as old as I am. After the car show, we headed to Bullfrogs Bar in Ortonville, MI for some lunch. He had the pizza, and I went for some soup and salad. I really like soup, especially for lunch. The house salad was pretty good for a bar, and the lobster bisque was quite yummy too. We went from there for a drive around, just enjoying looking at the local lakes and homes. Saturday night we went off the beaten path to a Korean BBQ restaurant recommended by a friend. Hubby has traveled to Korea a few times for a previous job and wanted me to share a bit from his experiences there. 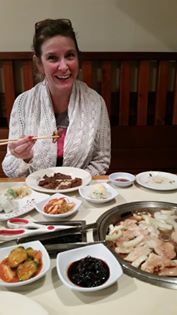 We went to the New Seoul Garden in Southfield, MI. I was a bit amused when we pulled up, as this definitely used to be a Chi-Chis. Inside, there was no mariachi music. LOL The service was friendly and attentive, and I trusted my hubby to order what he wanted me to try. My first new treat was California rolls - yes - until last weekend I had never tried sushi! They were very yummy. We then got to grill steak, chicken, and shrimp at our table, and they were delicious. He said you were supposed to serve them in lettuce wraps, with a chili paste that was also provided. I'm a knife and fork kinda gal (or in this case, chopsticks) and just ate the grilled meat and a few veggies. He recommended I not try the kimchi, since he said it was a little spicier than I would enjoy. I did taste the sprouts with some sort of ginger taste to them? He said they reminded him exactly of his Korean travels. Sunday morning (okay, it was noon) we headed back to downtown Lake Orion for breakfast at a great little cafe that's usually super crowded for breakfast. CJ's Lakeside Grill did not disappoint. I didn't even notice what hubby had, but I destroyed two eggs over medium, some American fries (at the waitress's recommendation), crispy bacon, and white toast. I'm not one to usually clean my plate, but boy I did that morning! on tangles I got to go with my chopped brisket. I consider myself kind of picky about my brisket, and this was delicious. Most of it was easily cut with my fork, or already falling apart. YUM! I mixed the original recipe sauce with the sweet sauce. Hubby got the pit-boss special of a half-rack of ribs, and I may have taken one of those to try too. I look forward to going back soon. So there you have the exciting weekend of two forty-somethings who were childless for a weekend. Are there any places you recommend we try when this happens again next summer? Or did we hit up your favorites this time? Oh, to be childless for a few days! Precious moments when you can relax, have some quiet time and eat out all the time. You inspired me to take my partner on a dinner date. Thanks! I went to a Dickie's BBQ when I was driving a rig. I'd never heard of it but it was delicious! Glad y'all enjoyed your time together.